Abu Dhabi, UAE (AP) — Dinesh Chandimal scored his ninth test century and first as captain as Sri Lanka posted 419 against Pakistan on day two of the first test on Friday. By stumps, Pakistan were a chanceless 64 without loss, Sami Aslam on 31 and Shan Masood on 30 to make honors even. Sri Lanka resumed on 227-4 after Dimuth Karunaratne’s 93, and Chandimal moved on from 60. He reached his ton in the morning with a cover drive. He needed 273 balls for his second century of the year. His overnight partner, Niroshan Dickwella moved from 42 to 83 when he edged Hasan Ali onto his off stump at 295-5. The wicketkeeper’s highest test score, surpassing 81 in July against Zimbabwe, lasted 117 balls, and included nine fours and a six. Dilruwan Perera replaced Dickwella and took 33 balls to get off the mark. In the meantime, he reversed two lbw decisions before he scored. After lunch, Perera also survived a stumping chance on 32 but was out for 33, the video this time confirming he was back leg before wicket, giving part-time spinner Haris Sohail a wicket on debut. Sri Lanka took tea on 403-7, then the end came quickly. 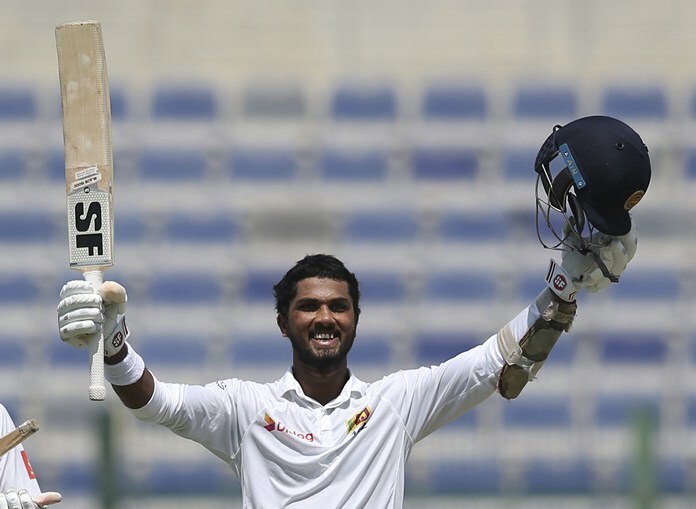 In an eventful 155th over bowled by paceman Mohammad Abbas, Chandimal lost his middle stump but the delivery was a no ball, and Lakshan Sandakan and Nuwan Pradeep were dismissed cheaply in consecutive balls to end the innings. Chandimal was stranded on 155, seven shy of his career-high score. He’d faced 372 balls, hitting 14 to the boundary. Abbas took 3-75 and left-arm spinner Yasir Shah had figures of 57-11-120-3.